MEDICA 2018 had perfecyly finished with some HIGHGRADE’s popular products! - HIGHGRADE TECH. CO.,LTD. Highgrade Tech. Co., Ltd.participated in MEDICA 2018, Düsseldorf International Medical Products and Equipment Exhibition. International professional medical equipment trade show, including electronic medical equipment technology, laboratory equipment and first aid equipment, diagnostic equipment, hospital communication technology, hospital kitchen and restaurant, hospital furniture and facilities, etc., from more than 60 countries every year. About 4,000 companies in the region were exhibited in 18 pavilions, with an exhibition area of 250,000 square meters and a total audience of 140,000 people, mainly for hospital procurement personnel, traders, manufacturers, agents, distributors, and R&D. Nearly 90% of the professional audience participated in the relevant investment decisions, 70% of which were decision makers. According to the survey results and the interviews of the exhibitors, the audience as whole showed a high investment tendency, andHighgrade Tech. Co., Ltd.is one of the exhibitors! Highgrade Tech. 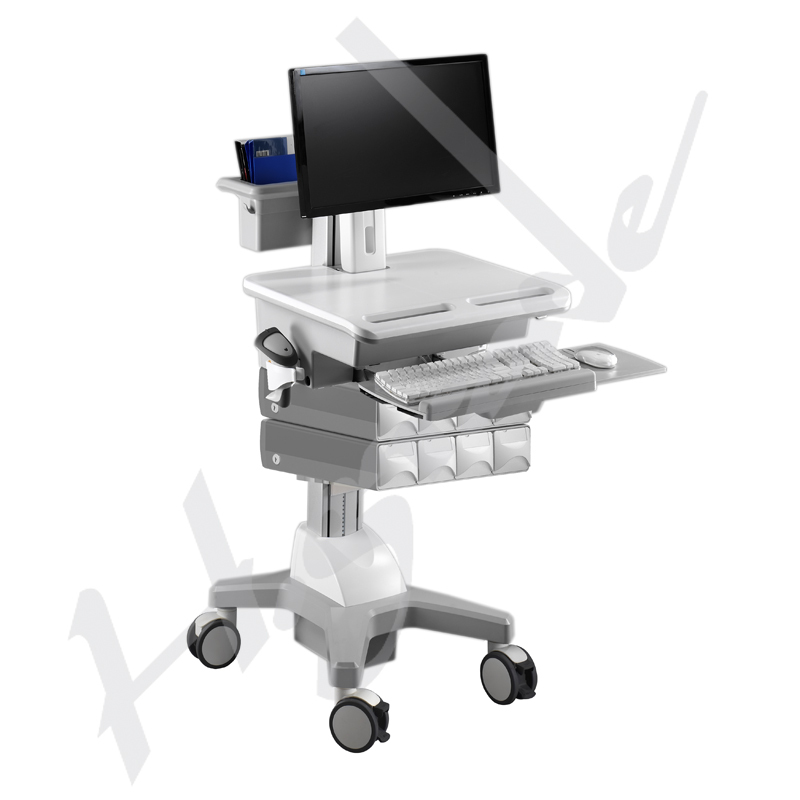 Co., Ltd. has committed itself as a leading Solution Provider for Display Mounting on Medical/Healthcare IT. HealthCare and Ergonomics have been our constant focus. Inherited a legacy on hinge know-how, Highgrade provides a broad diversified product line on helping clients to improve routine workflow on caregiving, offering ergonomic assistance to individual, leading users for accessible interactivities, etc. Positive experience has been well collaborated and we earned the credits from global clients. Main Products： Wall Mount、LCD Monitor Stand、Projector Ceiling Mount、Pad Holder、Tilt Wall Mount Bracket etc. product structure and It can carry 1~10 kg of product load. Easy to assemble, easy to use. Fully reflects the essential points of the light mobile check-in car. Adjustable desktop 80cm-130cm lifting range, 13cm screen freedom adjustment, suitable for all height users. Supports 24” screen, standard VESA hole 75x75, 100x100. Free choice of file holder, mouse holder, scanner holder, medical trash can, photography rack, medical drawer, main frame or tray. 可Adjustable height 124mm (4.88") - 436mm (17.27") range, suitable for users of all heights. The rotation angle can reach 360°. The universal LCD ARM is designed for ease of use by patients, caregivers and clinicians alike. This model provides a full extension at the reach of 1,407 mm (55.39”) and 671 mm (26.42”) for cantilever ARM height adjust. Screen swivel can be up to 360° while Tilt can be lifted 20° upward and 60° downward. Sincerely welcome interested customers to visit our official website and contact us directly!